Just the other day we had David Hasslehoff proposing to his Welsh girlfriend Hayley Roberts at the summit of Sydney's famous Harbour Bridge. It's one of the all time great tourism successes-shackling together groups of eager climbers and leading them to the top to take in the awe inspiring sight over Sydney's magnificent harbour. The Shuttle did it once. By the time you get to the peak the oxygen levels kick in. It's an instant high and you feel like taking on the world. Hence The Hoff and his fiancee following in a long line of those making life changing decisions (one reader unkindly suggests it was a publcicit stunt..surely not ?). Marriage proposals are the norm for couples chained together in their bridge issue overalls. Oprah Winfrey and gal pal Gail did it as our picture shows. Michael Caine and his gorgeous wife Shakira climbed as did Richard Branson and even the Vienna Boys Choir have all made been to the top. 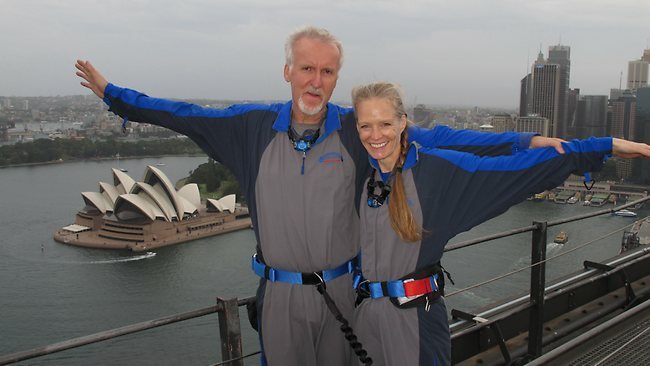 Now a Christmas visitor who was spotted on the bridge, movie director James Cameron has announced that he will be leaving America and moving South of the Equator. The director who spent December and January in Sydney with his family checking out facilities at Fox Studios has bought a 1067 hectares farm in New Zealand and will be moving there to live. In April this year Cameron, who directed two of the all time most successful films, Titanic and Avatar will move to the property which is about 90 minutes from Wellington and the Weta Digital studios that won an Oscar for it's work on Avatar. He will spend the next twelve months working on the sequel to Avatar.